The 'In the Line of Duty' memorial to New Jersey's first responders was unveiled in December 2014. Complaints have surfaced about litter and people not treating the site with the proper reverence in recent weeks. Mohammad Asghar respects the memorial for first responders located to the side of his Atlantic City Boardwalk food shop so much so that he waters the plants inside the fenced-in area regularly. He also pays homage each and every morning. "There are three words I say when I walk by," Asghar said Thursday afternoon. "God bless them." Still, a business decision he made that received city approval has rankled some in this resort town. Specifically, the issue is two picnic tables that he set up on the Boardwalk near St. James Place. But they won't be there much longer. He'll receive a letter from City Hall as early as Friday morning ordering their removal. It was news to him when PhillyVoice shared that update on Thursday, and a disappointing development for the businessman. "I haven't heard any complaints. My customers sit there, eat and then some go in to look at the memorial," he said. "When I applied for it, they said everything checked out." 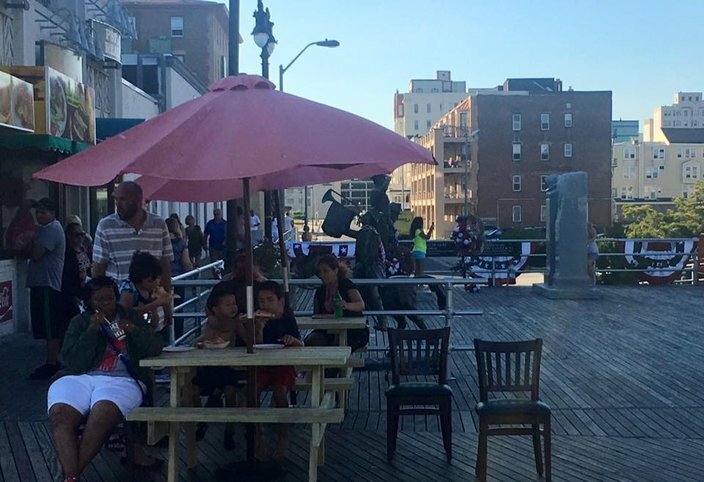 As far as the challenges facing Atlantic City go, a pair of out-of-place tables with umbrellas on the Boardwalk may not seem like much, but to some, it means quite a bit. In December 2014, the memorial to New Jersey’s fallen first responders – a pair of marble pillars represent the fallen World Trade Center towers – was unveiled near the ramp where St. James Place meets the Boardwalk. 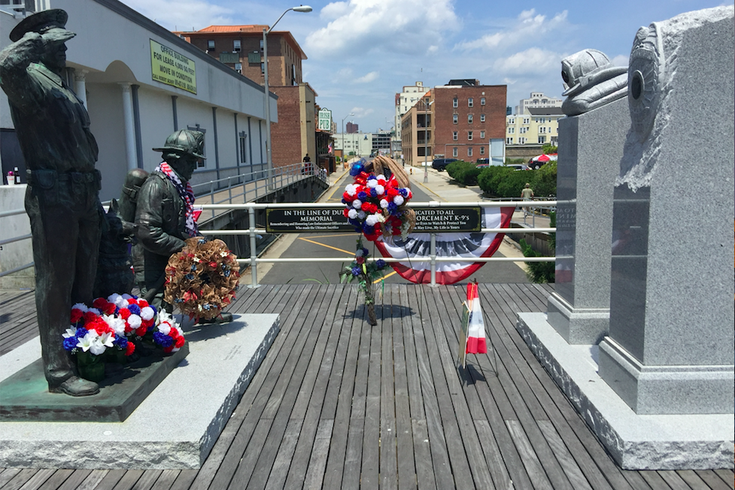 The modest memorial – sculpted by an artist from Toms River and spearheaded by Cathy Burke, who owns the landmark Irish Pub on that beach block – is set back from the Boardwalk enough that passersby might easily miss it as they walk past. Last week, it became a bit more difficult to find, courtesy of those tables. As if that wasn’t enough, despite a sign at the site which states “Appropriate behavior is expected. This is a place of reverence not recreation,” locals report having seen adults and children treating the “In the Line of Duty Memorial” as if it were a playground, or treading upon the sculpture and leaving trash behind. It became a social media issue when the tables appeared last weekend. 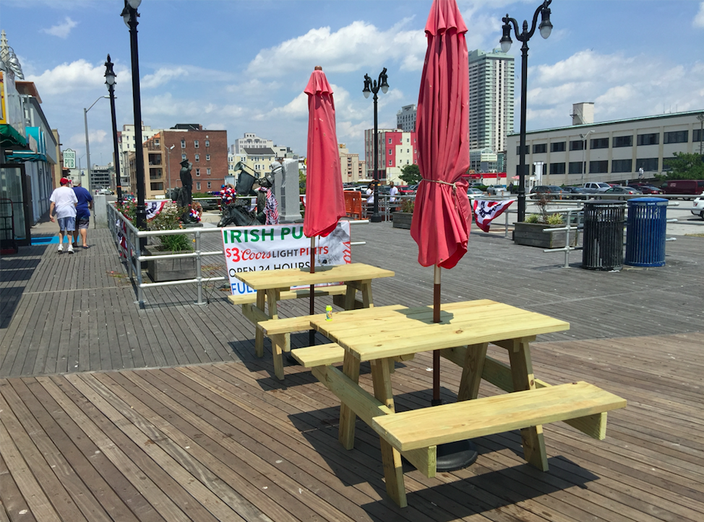 The online debate – see here and here – pointed out that the tables do not infringe on the memorial site's footprint, and noted that Boardwalk eateries are permitted to have outdoor seating for customers. Nonetheless, calls were made to officials seeking their removal. The point of contention: They aren’t in front of the corner-property business that advertises Halal food, hot dogs and pizza offerings, even though the windows do face it. The 'In the Line of Duty' memorial in Atlantic City is set back off the Boardwalk. Picnic tables in front of it are said to make the memorial easier to miss by passersby. While the Casino Reinvestment Development Authority (CRDA) oversees many facets of the Boardwalk District, it referred questions regarding the tables to the city which handles business licensing. Dale Finch is Atlantic City's licenses and inspection director. He also oversees the department of health and human services. On Thursday, he explained that the tables never should have been approved and that the city would send out a letter to the business owner calling for their removal. He noted that those sorts of beach tables aren't permitted by code and that a "revised" plan to include them shouldn't have been approved but somehow "slipped through" the application cracks. Since it's a revokable license, he said the tables should be removed in the coming days. "It didn't get picked up during the application process," he said. As for the bigger picture concerns, he said "people are sensitive about the memorial." For his part, Ashghar was disappointed, but noted that he would still start each day with that three-word mantra when he walked past.